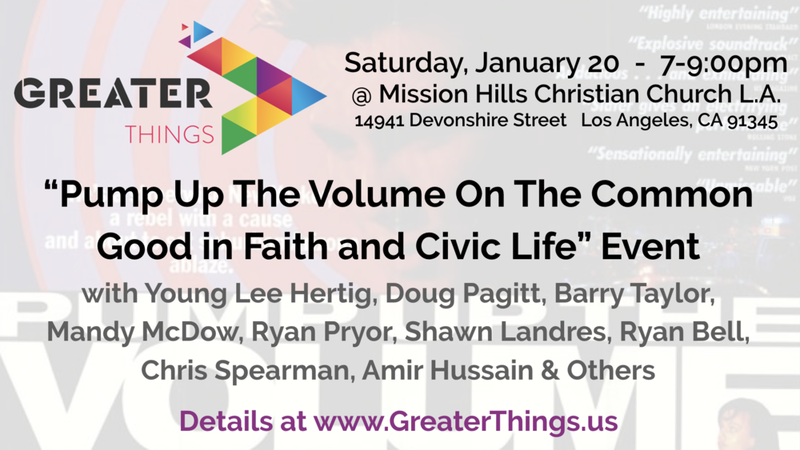 Mandy McDow, Ryan Pryor, Shawn Landres, Ryan Bell, Chris Spearman, Amir Hussain & Others hosted at Missions Hills Christian Church in L.A.
We will engage the questions, "What does it mean to pursue the common good in faith and civic life? Can faith be a true catalyst for common goodness or does it primarily reinforce “tribal differences”? How can we tell the stories of common goodness and connection with more volume? This event will profile people who are doing their part in connecting their beliefs, assumptions, passions and desires with the need for greater connection to one another. The question of the role of faith in this endeavor will be part of the conversation. People from humanist, atheist, Christians, and Jewish perspectives will bring their stories and ideas. So channel your inner Christian Slater from the 1980's and join us in Pumping up the Volume on the common good.